Every Tuesday at work we have ‘soup day’. Someone from the office brings in homemade soup and shares with the soup people; this week was my turn. Part of bringing in soup is supplying some bread to dunk so this morning after setting the soup up in the office crockpot I ventured to the market to grab some freshly baked bread. 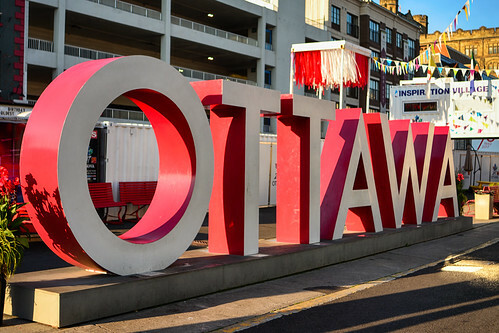 I passed by the inspiration village and noticed how quiet it was and decided to drag my camera out of my bag to get a shot of this gigantic sign reminding people what city they were in. I haven’t done much to celebrate Canada 150 but I may as well make use of a good photography opportunity when one presents itself! Hope everyone has had a good day. Oh, and if you’re wondering, it was cream of asparagus soup and it was a hit!